Belkin TAA compliant multimode duplex fiber patch cables feature top quality Corning glass core. For more than 25 years, Belkin has been an industry leader in cables and network infrastructure. 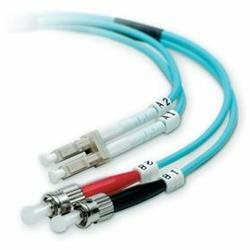 Our TAA-compliant CAT5e, CAT6, and fiber patch cables utilize quality components and advanced manufacturing techniques to ensure consistent, top-quality network performance. All Belkin cables are guaranteed to meet or exceed industry standards and come with a lifetime warranty.